The club has an engraved coin die for people to strike their own Roman coin to keep. This coin is based on the legionary coinage of Marc Antony (32 BC), which shows a trireme warship with Antony's name and titles on the obverse, and the Roman eagle between two legionary standards with every coin having the different legion numbers of Antony's legions on the reverse. In 169 AD the emperor Marcus Aurelius reissued this coin, but with only one legion number - Legio VI Ferrata. The Legio VI coin is shown below. This is your coin! Silver denarius of Marc Antony, Triumvir and Imperator, 44-30 BC, LEG VI Ferrata. Obverse: ANT•AVG / III•VIR•R•P•C, galley right with rowers, mast with banners at prow and battering ram. ANT•AVG (Antonius augurus) associates Antony with Julius Caesar, who had also held the augurate Roman priesthood. III•VIR•R•P•C abbreviates Triumvir rei publicae constituendae ("One of Three Men for the Restoration of the Republic"), which was the title adopted in 43 BC by Mark Antony, Octavian and Lepidus when they formed the Second Triumvirate. 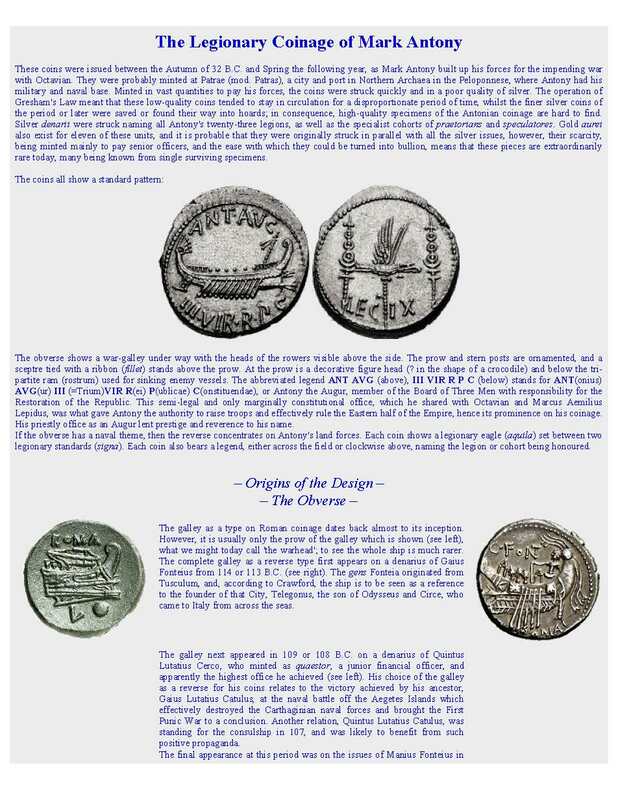 Roman coinage in the name of Marcus Antonius extends from 44 to 31 BCE and the so-called legionary denarii issued in 32-31 BCE to pay his army are, by far, the most abundant Roman silver coins. The best estimate is that between 25 million and 35 million pieces were struck (Harl, 60), and tens of thousands survive today. There are two theories about where these coins were minted. Some believe there was a mobile workshop that moved with Antony’s army in northwestern Greece, while others argue the coins were struck at the town of Patras, which served as Antony’s winter headquarters. The coin’s obverse shows a galley, sometimes described as Antony’s flagship. The ship has a single bank of eight to 12 oars (the number of oars was probably left to the whim or patience of the die cutter). Above the ship ANT AVG abbreviates the name Antonius along with one of his titles, Augur, a priest of the Roman state religion. Below the ship is his other title III VIR. R.P.C. (tresviri rei publicae constituendae), which loosely translates as “Triumvir for the Reorganization of the Republic”. A triumvir in this case was a member of the “Second Triumvirate” an informal powersharing arrangement formed in 43 BCE between three men: Antony, Octavian (Julius Caesar’s great-nephew and designated heir,) and Marcus Aemilius Lepidus (c. 88 – 12 BCE), last high priest of the Republic and Caesar’s political ally. The reverse shows a legionary eagle (aquila) between two standards (signa; singular signum), with an inscription identifying one of the units in Antony’s army. The gilded bronze eagle mounted on a pole was the legion’s sacred emblem – its loss in battle was the worst disgrace a unit could suffer. A standard bearer (signifer) in each of the legion’s 10 cohorts carried the signum, a pole adorned with metal discs and crescents. A full-strength legion in this era had about 4,800 men, and a foot soldier earned 225 denarii a year, paid in three installments. A unique piece that appeared in a 2012 European auction provides a clue as to how these coins were made. The space where the legion number would normally appear is blank. This coin supports the theory that dies were prepared in advance, and the legion numbers were engraved as needed. This may have been a trial strike, not intended for circulation, or perhaps an emergency issue, rushed into production with unfinished dies. ​For the First Legion, rather than a simple Roman numeral “I,” part of the number is spelled out: LEG PRI for Legio Prima. This is by far the rarest of all the coins in the series, with only three genuine examples recorded in the CoinArchives Pro database at recent auction prices that ranged from $6,700 to $8,100 USD. Roman numerals were not standardized in that era: “four” might be written as IIII or IV, “nine” might be written as IX or VIIII, and so on. The die engravers might have been Greeks unfamiliar with Rome’s awkward numerals (Greek numerals are much simpler and more logical). There are coins with obvious errors like “IIX” for “XII”. Legion VI seems to be one of the most common types, with 175 examples in the CoinArchives Pro database. An exceptionally high-grade specimen brought over $3,000 in a recent European auction , but well-worn examples can be found for $100 or less. Three of the legions had honorific names as well as numbers. Legion XII Antiquae (“The Old One,”) Legion XVII Classicae (“of the Fleet”) and Legion XVIII Lybicae (“The Lybian”; apparently in reference to a victory there, not where the troops were recruited). All of these coins are fairly scarce, with 38, 33 and 20 examples listed in the CoinArchives Pro database, respectively. ​Antony’s army had two special units that were also honored on the legionary coinage. The Praetorian Cohorts (COHORTIUM PRAETORIARUM, probably four in number) were elite units that served as the commander’s personal bodyguard, in camp as well as in battle. The Speculatores (COHORTIS SPECULATORUM) were reconnaissance troops who also manned the scout cruisers of the fleet. 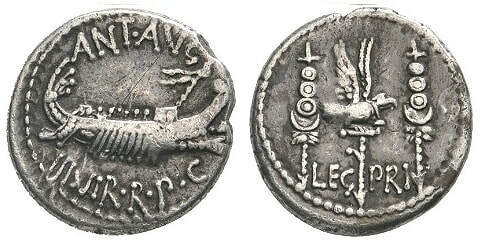 The unusual reverse of the Speculatores’ denarius shows their three standards adorned with model ships and crowned with wreaths, indicating that they played a key role in some naval victory. Both of these types are scarce, with 25 and 27 examples listed in the CoinArchives Pro database, respectively. Although there were just 23 numbered legions in Antony’s army, there are rare examples of coins with higher numbers. These have generally been dismissed as die engraver’s errors or forgeries, but some may be an early example of “operational deception” intended to exaggerate the army’s true size. The existence therefore of legions in the service of Antony with numbers greater than XXIII which have escaped the notice of history is entirely possible; many of his units were never at full strength, and some may have effectively marched only on paper. Certainly, it seems to be the case that the suppressed Republican legions in Antony’s service had their records completely erased after the war. It remains probable then that not all of these fleet denarii for legions over XXIII are false or errors as has been assumed, as is demonstrated by the present clearly genuine example unambiguously inscribed LEG XXXIII . About a dozen gold aurei struck with the same dies as the silver denarii are known. 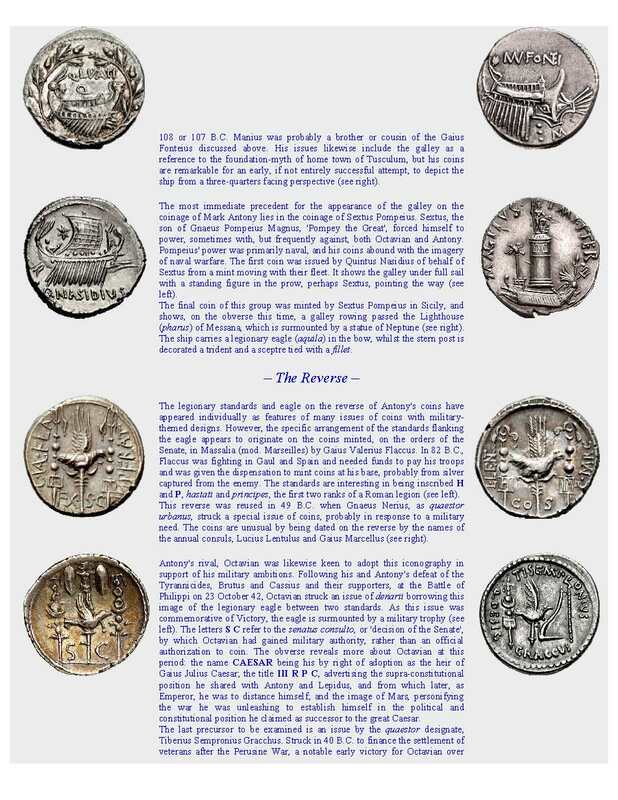 Only four examples have appeared on the numismatic market in recent years. Unlike the debased silver (85 – 90% pure) used for the denarius, the gold is very pure and the surviving coins are full weight — about eight grams. A Legion II aureus, pedigreed to the famous Hunt Collection, sold for over $205,000 . A Legion XIII aureus brought almost $160,000 in 2015 ; a Legion XIX realized over $67,000 in 2008 ; and a Legion XXII example went for nearly $64,000 in 2009 . Marc Antony's original legionary coins were still in circulation in 169 AD when the two Roman co-emperors Marcus Aurelius and Lucius Verus made an over-struck reissue, all of which honored only one legion - Legio VI Ferrata. However, the original inscription of ANT•AVG was changed to ANTONIVS•AVGVR to avoid confusion (since AUG had now come to mean AUGUSTUS). The obverse depicts a rather squashed warship, and the reverse legend is ANTONINVS ET VERVS AVG REST LEG VI meaning “Antoninus and Verus Restore Legion VI”. Silver legionary denarius, restitution by Marcus Aurelius and Lucius Verus. Reverse: ANTONINVS ET VERVS AVG REST / LEG•VI, aquila (legionary eagle) between two legionary standards. There are several explanations for this remarkable restoration type. Perhaps Legio VI Ferrata, which fought for Antonius at Phillipi, also played a leading role in the Parthian War of 164 AD under Lucius Verus. Or maybe to commemorate an event, such as the 200th anniversary of Actium, or the Parthian victory of P. Ventidius in 38 BC, or the conquest of Armenia by P. Canidius Crassus in 37 BC. Alternatively, maybe the old coins were taken out of circulation simply for their silver content, and reissued as a sort of familiar 'replacement', but with just one legion for simplicity. However, there are two versions of this coin, No. 500 (the legionary eagle is facing right, between two signa, with the one on the right surmounted by Victory, to the left, crowning the eagle’s head with a wreath) and No. 501 (legionary eagle facing left, and there is no Victory on the standard to the right). In either case, this type of restitution must have been minted in 163 or 164 AD, and thus related not to the Parthian campaign. The association with the names of L. Verus and M. Aurelius on the restitution denarii of legio VI Ferrata may have been thus due to a special link between this legion and the imperial household. 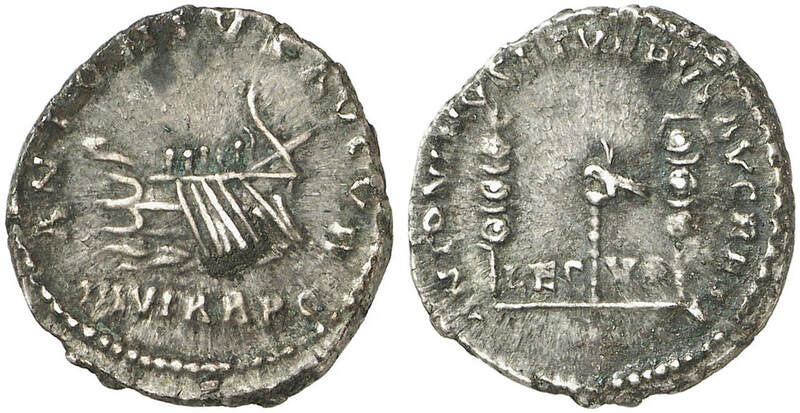 The denarii Leg VI without Victory or a wreath could have been minted shortly before the capture of Ctesiphon in 165 AD, with the aim of showing the fundamental relationship between legio VI Ferrata and its commander Verus. The LEG VI denarii with Victory and the wreath can, on the other hand, be interpreted as originating somewhat later, and were probably minted in 165/6 CE, once the war in the East had ended and in commemoration of the victorious role (Victory) of legio VI Ferrata, which had entered Ctesiphon with Verus. Furthermore, there can be little doubt that it was the capture of the Parthian capital that won Verus the title of Parthicus in 165 AD.